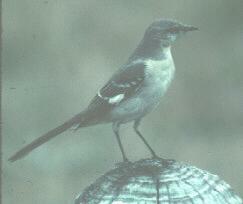 Description: The Northern Mockingbird, a medium-sized songbird, is dull gray above with paler underparts. The white outer tail feathers of the long tail and white wing patches are visible in flight. Life History: The Northern Mockingbird is the most widely-known songbird in America. It is the state bird of Texas, but perhaps best known for its singing abilities. 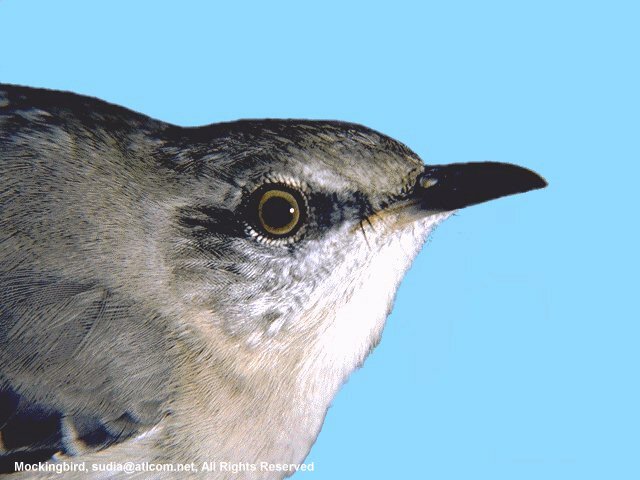 Not only can it perform 39 species' songs and 50 call notes, but it also can mimic sounds such as that of a barking dog, squeaky hinges, notes from a piano and even a cackling hen, so expertly that even an electronic analysis could not tell the difference between the mockingbird and the original. 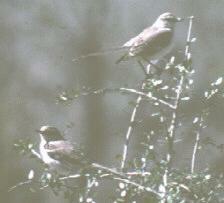 Mockingbird nests can be found one to 50 feet above the ground in the fork of a tree or on the branch of a bush. The bulky cup is built by both sexes with items such as twigs, dry leaves, stems, cotton, paper, grass and other handy materials. Like many other songbirds, mockingbirds feed on fruits and insects. Though territorial all year around, during the nesting season which falls between March and August, mockingbirds are especially aggressive. They regularly may attack starlings and grackles and even cats if they feel threatened. The female is the sole incubator of the three to six blue or green eggs that are blotched with brown. They hatch after an incubation period of 11 to 14 days and are then tended by both parents, although they are brooded only by the female. Thereafter, the young will leave the nest once they are 10 to 12 days old. Habitat and Distribution: The Northern Mockingbird is distributed widely and it has extended its range much farther north in recent years. They range throughout North America from southern Canada south to Mexico. They even have been introduced and established in Hawaii. 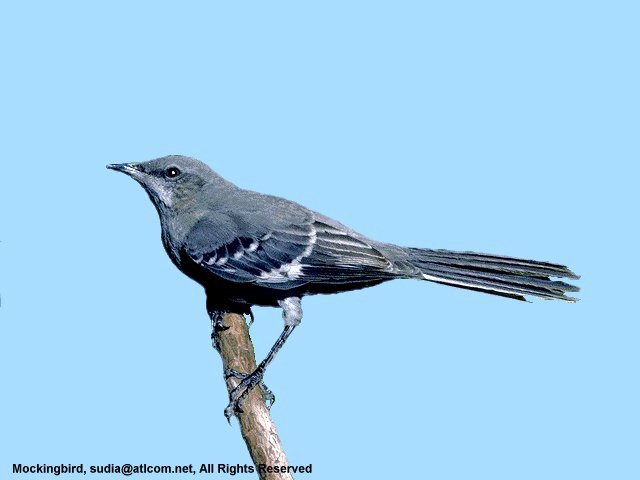 Mockingbirds live year-around across Texas where they frequent lawns and gardens in urban and rural environments, edges of open woods, farmland, streamside thickets and brushy deserts.